A delegation of Crime New Territories North (NTN) Headquarters visited Lufeng, Guangdong Province, from November 7 to 9 to share experience with their counterparts about the tackling of triad-related crimes and drug offences. 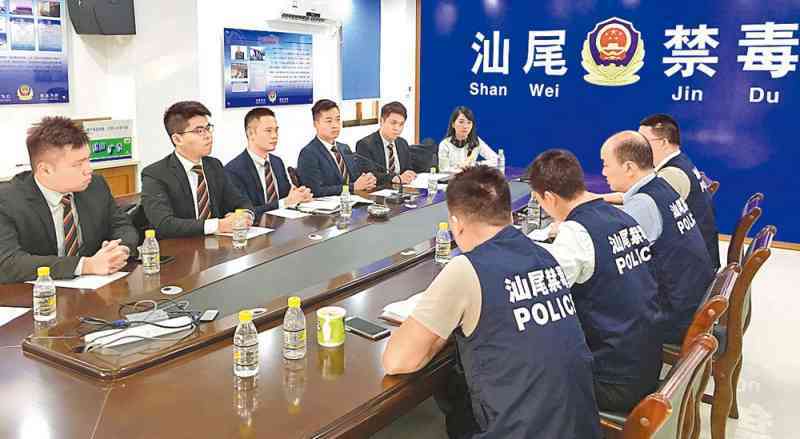 Led by Chief Inspector of Regional Anti-triad Unit Wan King-hang, the delegates included six detective inspectors from different districts in NTN. The delegation called on an anti-drug detachment of Shanwei Public Security Bureau. Both sides conducted in-depth exchanges on the situation of trafficking in dangerous drugs, as well as the corresponding operations and strategies. Afterwards, the delegates visited Lufeng Anti-drug Education Base, Boshe Village in Jiaxi Town and Jiazi Harbour to learn about their actions to combat drug trafficking as well as their public education campaigns. They also explained to local officials the Hong Kong Police's actions against the exploitation of young people for drug trafficking.